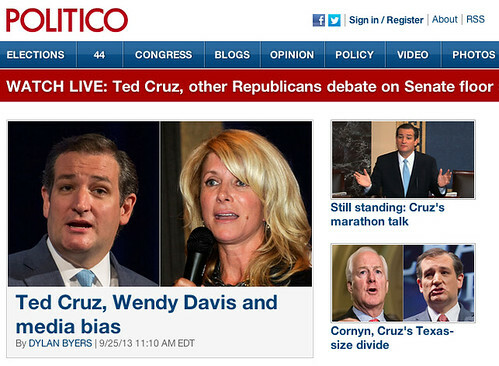 Ted Cruz, Wendy Davis, and Politico's bogus claim of media bias. Davis’s filibuster was no more likely than Cruz’s to change the law. Davis’s filibuster was just as self-promotional as Cruz’s, and just as directed at a bid for higher office. When a Democrat like Texas state Sen. Wendy Davis filibusters against abortion restrictions, she is elevated to hero status, her tennis shoes become totems. When Cruz grandstands against Obamacare, he is a laughingstock in the eyes of many journalists on Twitter, an “embarrassment” in the eyes of The New York Times editorial board. … Cruz is portrayed in the media as “aimless and self-destructive” (NYT ed board), elitist (GQ) and likely guided more by presidential aspirations than principles (CNN). Josh Marshall, the editor and publisher of Talking Points Memo, had no qualms about coming right out and calling Cruz, his former Princeton colleague, an “arrogant jerk” — and worse. Does this prove anything? Byers says that CNN described Cruz as “likely guided more by presidential aspirations than principles.” But the story he links to suggests that Cruz has multiple motivations, while “critics question his motives” and ask “is this about his principles or about presidential aspirations?” Doesn’t read like the news division taking a stance on this. Neither does the NYT edit board’s position—it’s an edit board. Of course a liberal edit board is in favor of liberal grandstanding and against conservative grandstanding. What does that say about journalists writ large? And what does it say about the coverage of Davis? Let’s compare. - Before her filibuster, outside of Texas, Davis was a largely unknown figure. Before this filibuster, Cruz was a national figure—he’d been profiled as long ago as 2011 by the New York Times. The new celebrity gets the new story. Them’s rules. 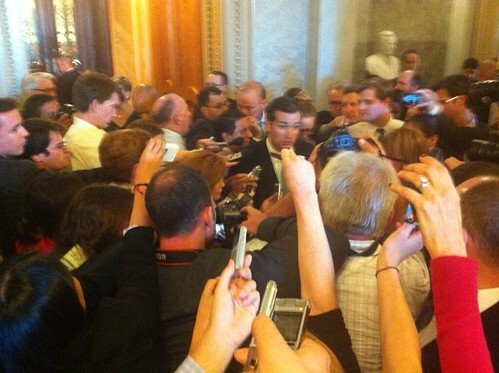 - Cruz’s filibuster was actually covered more than Davis’ in real time. Davis’ filibuster only became a story as social media, mostly Twitter, started discussing it. As Carl Franzen reported at the time, “viewers of the major national cable and broadcast networks would be forgiven for not knowing who she is or what she did on Tuesday night. After all, during the filibuster’s momentous conclusion, CNN aired a repeated segment of Piers Morgan and Anderson Cooper discussing the calories in a blueberry muffin.” Cruz’s filibuster was covered heavily in real time by the Capitol Hill press corps. One example, this was what Byers’s site looked like around 11 a.m. - Davis’ filibuster happened under stricter standards. She had to stand consistently without assistance; her speech was shut down after a colleague adjusted her back brace. Cruz had to stand, too, but he was allowed to drink water and enter dialogues with other senators, who occasionally took the burden from him. - Davis was filibustering a bill to ban abortions after 20 weeks, and to tighten regulations of abortion clinics. National media—on the left, sure—was already working that story as similar laws moved in North Carolina and Ohio. Davis provided a new hook. - Davis temporarily won, while reporters knew that Cruz wouldn’t win. At the start of his remarks, Cruz specifically said that he was speaking before a vote that he didn’t consider definitive; as he spoke, Harry Reid’s office revealed that Cruz did not actually plan to delay this vote. But Davis was trying to eat up the last hours of legislative time so that Austin would end its session without passing a bill. With the help of an unruly mob that shouted down legislators, she won. (Note also that unruly mobs make good copy.) Carney says it was clear at the time that Rick Perry would call a new session and get the bill passed, but that only became clear as Davis’ filibuster dragged on—and, hey, that’s more of a kinectic action than Cruz’s. - Davis didn’t just get softballs from the media. Absolutely, she got some gauzy questions from Vogue and from network news. But in the “glowing interviews” piece Carney links to, one questioner pointed out to Davis that “There is a poll out down there by the Texas Tribune that says sixty percent of Texans support banning abortions after twenty weeks, which is one of the things that this bill would do.” Another told her to “look at some recent polling … indicating even among women there’s 50% support for a 20-week abortion ban.” Of the 20 questions cited in that story, eight of them push Davis on the substance of the bill or the fact that it’ll pass anyway. Actually, that reveals the fallacy behind this whole “bias” charge. Davis’ filibuster made her a star on MNSBC and in the New York Times, but not on Fox News. Cruz has been on Fox News every night this week, talking strategy; he’s kept conservative media in the loop. Conservatives are annoyed that liberal-leaning media canonized Davis and let her shape her story. They’re simultaneously annoyed when conservative media doesn’t let Cruz shape his story.